Can I be honest for a second? ….Yes?? Ok. It takes so much time. And Spring is right around the corner. I just know it. (Despite the inches of snow that keep coming each week!). And with Spring comes this intense “I-need-to-get-out-of-this-house! !” sensation. Who has time for long cleaning sessions on the weekends?! I know I don’t. So, this season, I’m putting a few things in place to help make spring cleaning a bit easier to manage. Feel free to add in your own tips in the comment section! I think we all know the Power of the Microfiber, yes? They’re perfect for cleaning windows with just hot water and no chemicals (and it leaves surfaces virtually streak-free). But they’re expensive if you buy them in the cleaning aisle. To score a better deal, head to the automobile detailing section of Target or Walmart or one of those places, and score a bunch of them for super cheap! You can always save money when you shop other sections for things! 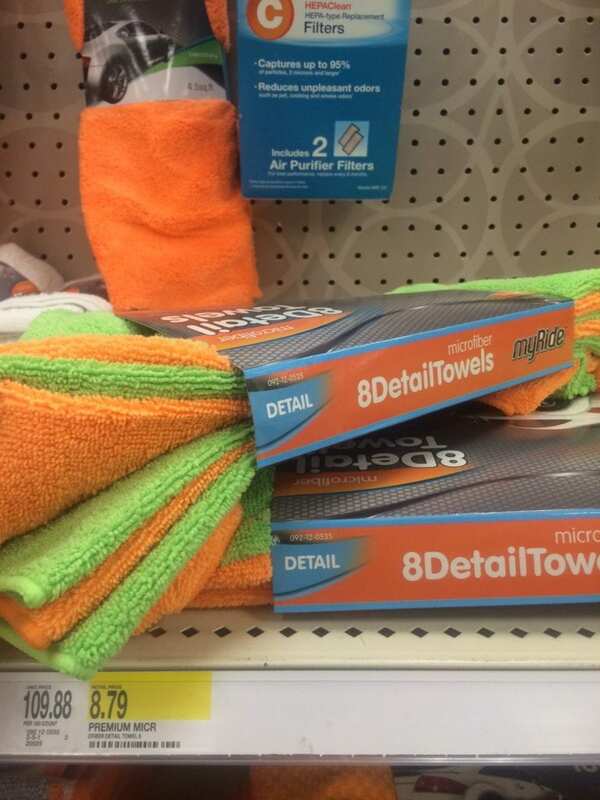 I stopped in at Target tonight and saw this pack of 8 microfiber towels in the Automobile section (and they’re HUGE) for a mere $8.79. SWEET! I know, I know…it’s so hard to just put something back in its place. Every time. Every object. Back in its place. But it really does amazing things. First, it eliminates big piles of clutter around your house. No pile = no clutter. Secondly, no clutter = more time to play outside and enjoy doing other things with hubby and the kids. Next time you find yourself putting something down to put away later, stop yourself. Go put it away. Try it for a 2 weeks and see if it decreases the time you spent having to clean up the larger messes that build up when things aren’t put away. If you have males in your house, then I’m sure you can identify with the…um….stinky bathrooms, huh? 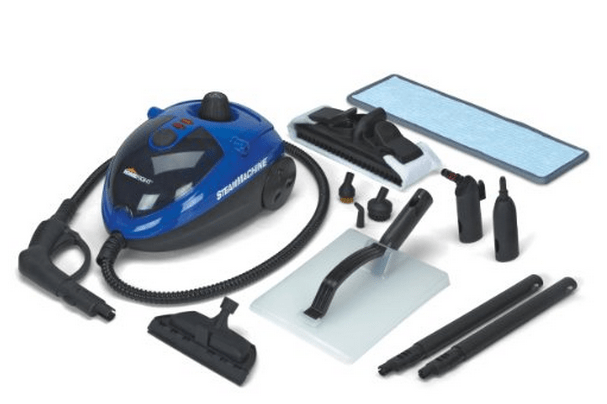 The HomeRight SteamMachine cuts deep into the grim and refreshes your toilets without chemicals, just steam. Love that! If you’re like me, you hate getting rid of things because you are afraid you’ll “need it” at some point. What ends up happening is that we hoard more than we need, and create unnecessary clutter with things we end up not ever using. To eliminate this problem, try boxing up everything you haven’t used or touched in the last 6 months. 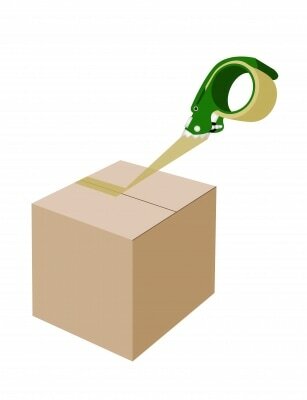 Label the boxes and put them in the garage, a spare bedroom, or the trunk of your car, for 3 months. Whatever you end up needing, pull out of the box. (I know, you hate rooting through messy boxes, but bear with me here….). After 3 months, whatever you haven’t pulled out of the box, simply gets taped up and off to the thrift store! Have you ever noticed your messy sink in the bathroom, but turn your head and say, “Oh, I’ll clean it later” when you realize all the cleaning stuff is allllllll the way downstairs?? Yeah. ME TOO!! 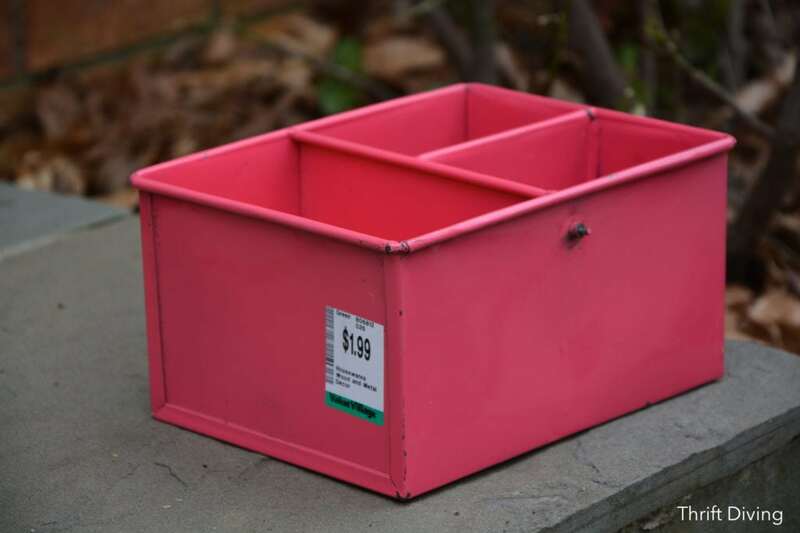 Try getting an old thrift store container or bucket to keep things in, with lots of compartments, and store this cleaning catty with towels, natural cleaners (like vinegar and water) in all rooms of your house. 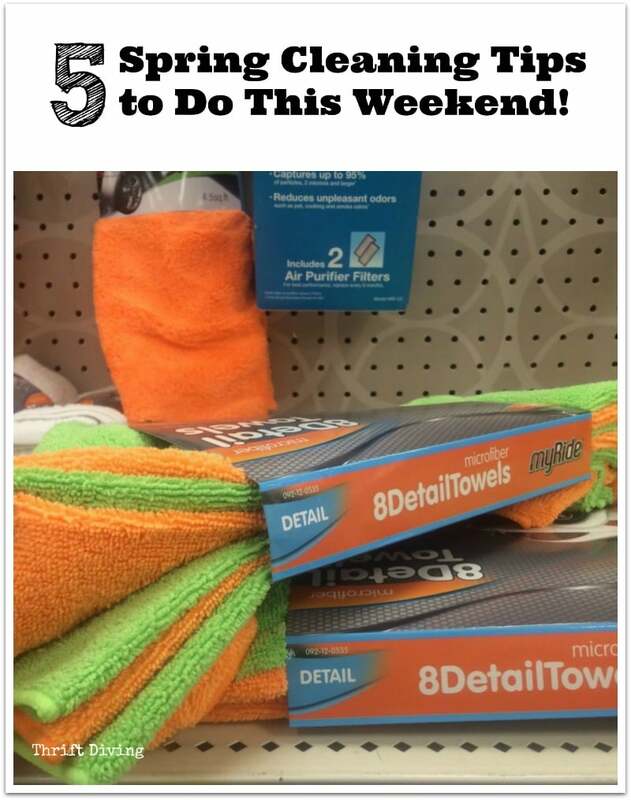 Your house will be on its way to being super clean this weekend! So what spring cleaning tips do YOU have? Leave a comment below with your tip! My favorite cleaning solution is a 50/50 mix of vinegar and Dawn dish detergent. Is awesome on hard water stains and just about anything else. 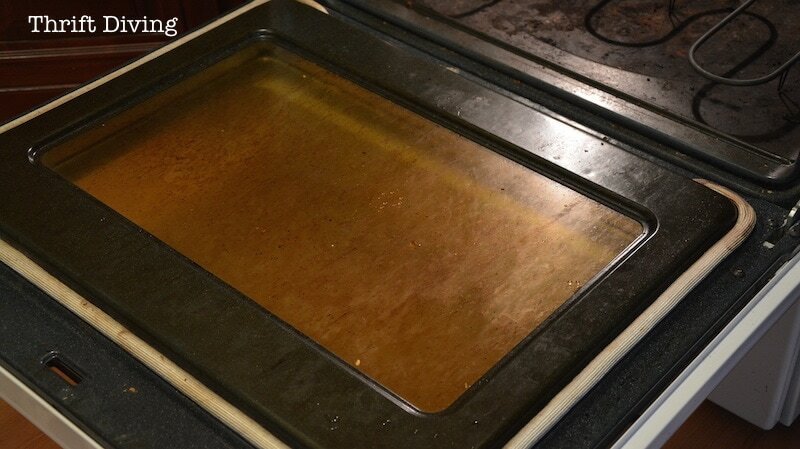 My welder-Dad taught me the trick about WD-40 for shining stainless steel sinks 30+ years ago. I love spring cleaning period and it is so nice to read your recommendations. In general I love my home to be clean and shining from every side, but during winter time it is difficult to be totally clean. Therefore, the spring reminds me nothing else but fresh and clean! I actually got a hand held Shark steam cleaner that was brand new with a ton of extra accessories at the THRIFT STORE for $8! I love that thing although it doesn’t look as heavy-duty as your HomeRight machine. 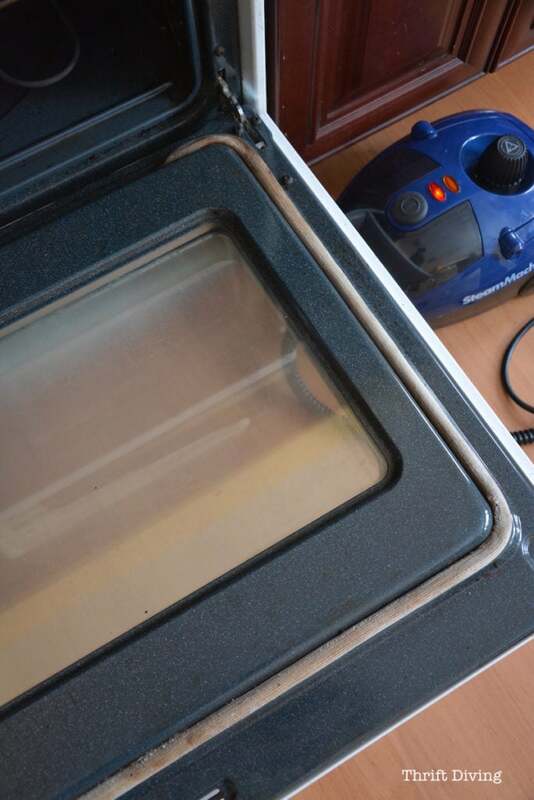 It is perfect for cleaning our steam shower glass especially since we have hard water. Thanks for great suggestions. I do have one comment — the pop-ups on this article drove me crazy. Sorry, but I would prefer reading a site without all the stuff I have to “clean up” (pun intended)! Happy cleaning! Great great tips!!! Who doesn’t need cleaning tips!!! Thanks for sharing these great tips. Looking in the automotive aisle is a great suggestion. I have wanted to get a steam machine so I am looking forward to reading more about yours. Love your blog and learn so much. I hope you have great luck at your booth. Thanks, Debbie! Here’s a video I did on the Steam Machine that you might find helpful. I LOVE that thing! My kids (I think they’re to blame) lost the cap to the machine, so I haven’t been able to use it! EEEKKK! Microfiber hates me- those things stick to my hands like Velcro. I saw one of those steamers on Craigslist the other day. Hmmmm. I learned, while living in less than 400 square feet for over 11 years, to always put things away when I was finished, but it’s virtually impossible to train the hubby. We are working on the grandkids, however! That means you have rough hands! LOL. Girl, I’m in the same boat as you. I hate the way microfiber feels on my hands! I have rough “man hands” because I’m always washing dishes, cleaning paint brushes, or doing something “non” feminine with my hands. Wow, less than 400 feet means not a lot to clean. PERFECT! My house, although not huge, is not easy to clean. About 6 months ago, I learned to start cleaning up after myself better, but the kids don’t seem to get it (like your hubby). But at least, with MY mess, it’s working well! My rule–never leave a load of clean clothes on the counter. Everything must be taken out and folded before the next load goes in. Has cut down on the frustration of sorting through disorganized piles!